One of the special joys at intricate liturgical services at the Cathedral Basilica of SS. Peter and Paul in recent years has been the beautiful soprano voice of cantor Charlene Angelini emanating from the ambo. It is, as her surname suggests, angelic. As of the beginning of September she has been promoted to director of the Cathedral Music Program and hopefully worshipers can expect more of the same for many years to come. Now she will be responsible for the overall execution of the Cathedral music program, choir, scholae and cantors. Music comes natural to Angelini, it’s in her blood, and her first love was the piano. The younger of the two daughters of Ramona and Alfred Angelini, she was raised in St. Frances Cabrini Parish, Fairless Hills. There was always music in the house; her mother loved to sing. When her sister, Christina, now an accomplished pianist, began taking formal lessons, little Charlene started playing by ear. Her singing ability was first noticed when she was 10 in 1991 and chosen to cantor at the school May procession. “The love of music ministry and cantoring was sparked in me, and I started to cantor the 9 a.m. Mass. I did that until I graduated from college in 2003,” she recalls. After St. Frances Cabrini School she went on to Nazareth Academy High School on a music scholarship where she participated in all of the musicals and played accompaniment for the choirs. Then, on another full scholarship, it was on to the University of West Virginia, which surprisingly has many more Pennsylvania students than West Virginians because of its proximity to the border. Although her scholarship was for piano she double majored in both instrument and voice. After graduation she came home to Philadelphia, and over the years did mostly cantoring and teaching. She has taught music at both Nazareth Academy and Waldron Mercy Academy, and in her early career was a relief cantor at various parishes. 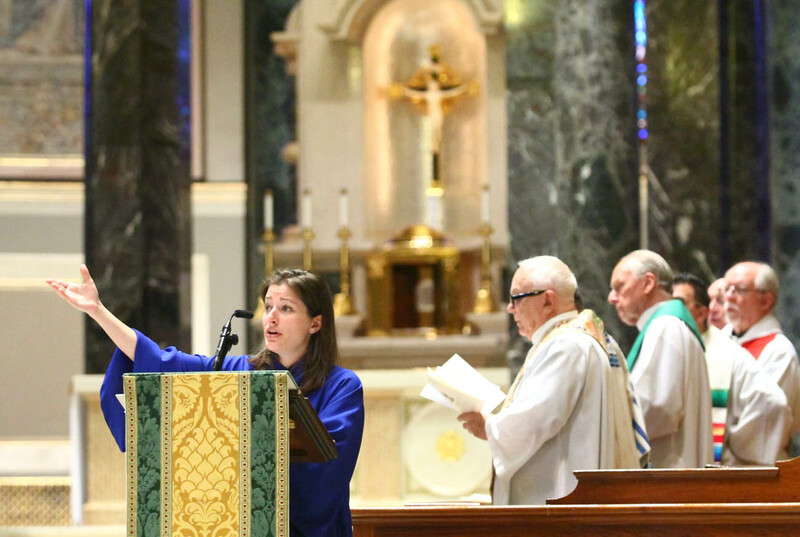 Twelve years ago she agreed to substitute at Our Lady Help of Christians Church in Port Richmond, but Father Edward Kelly persuaded her to stay on as music director, which she did, only relinquishing it recently because of Cathedral duties. “The people there were really lovely,” she said. She has been cantoring at the Cathedral for Sunday evening Masses and special liturgies since 2010. She auditioned for John Romeri who was then director of liturgical music and he hired her on the spot. Since then she has led the singing at many special events including two papal Masses, the funerals of Cardinals Anthony Bevilacqua and John Foley, the ordinations for most deacons, priests and bishops, the Christmas Midnight Masses, and most poignantly, the funeral Masses of several police officers who died in the line of duty. “I really felt privileged to honor these men,” she said. But Angelini is not a musical snob. Certainly she loves Chopin, as do all pianists, but she grew up with the Beatles and the Rolling Stones; she sang with a jazz group in college and enjoys the music of Sarah Petrella. 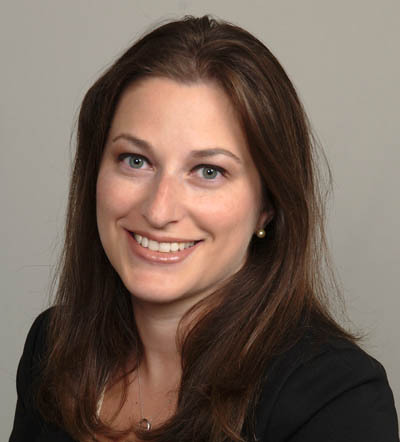 In her personal life, Angelini has been married to Stephen Lukach since 2008. They have a little daughter, Angelina, who is just turning 2. Angelini credits her musical gift to her Italian heritage and excellent teachers during her student years. She also learned through the direction of John Romeri at the Cathedral, and now working with Father Dennis Gill. As music director at the Cathedral, “I would like to continue the program that is here,” she said. “We have come back to chant in a way that I think is very representative of our history. I would like to continue in that vein, looking for appropriate introit entrance antiphons as well as communion antiphons. Charlene Angelini has a beautiful voice that not only pleases the ear but most of all it touches the heart. She also possesses superb musicianship and delivers refined performances. Thus, her singing enhances the religious experience and makes it more meaningful.